Day after report of new sanctions on ballistic missile program, Iranian president orders to expand program in UN sanction breach. A day after reports that US President Barack Obama is planning new sanctions on companies taking part in Iran's ballistic missile program, Iranian President Hassan Rouhani came out swinging Thursday, giving an order to escalate the missile program. Rouhani issued a decree to Iranian Defense Minister Brig. Gen. Hossein Dehqan to accelerate Iran's production of "various types of missiles," reports the Iranian state-run PressTV. According to the report Wednesday, the potential new sanctions would target about 12 companies and individuals in Iran, Hong Kong and the United Arab Emirates for their suspected role in developing Iran's ballistic missile program, which is limited by UN sanctions over the potential development of nuclear-capable missiles. US officials have said the Treasury Department retains a right under July's controversial nuclear agreement to blacklist Iranian entities suspected of involvement in missile development. 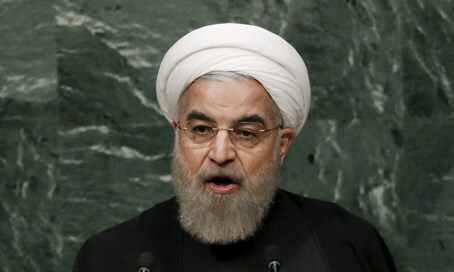 “In line with the ratified defense policies, it is necessary that the program for the production of various types of missiles needed for (Iranian) Armed Forces continue with more speed and seriousness,” Rouhani said. In October, Iran conducted a ballistic missile test, eliciting strong condemnation from members of the UN Security Council. A month later, it tested another ballistic missile, and an American official said other undeclared tests occurred earlier than that. A team of UN sanction monitors said in a confidential report seen by Reuters on December 15 that a medium-range Emad rocket that Iran tested on October 10 was a ballistic missile capable of delivering a nuclear warhead, making it a violation of a UN Security Council resolution. The new raft of sanctions would prohibit US or foreign nationals from conducting business with the companies. US banks would also be required to freeze any assets the companies or individuals hold inside the American financial system.